It’s called Restaurant Normandin, situated in foggy Rivière-du-Loup just west of the Gaspe Peninsula. 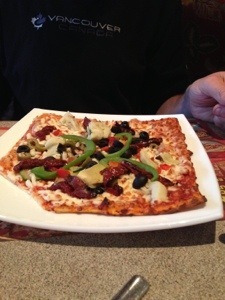 The thin-crusted square vegetarian pizza was just what we needed. 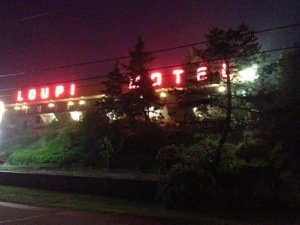 We had driven 975 kms in 11 hours and after checking into the delightful Motel Loupi we needed to eat. Since entering La Belle Province it was the first time we ran into difficulty communicating with anyone. While I dusted off what little dodgy French I had, our server rallied in broken English and served us a delightful dinner. 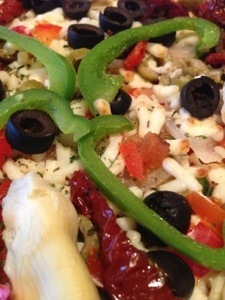 Our veggie pizzas included moist (but not oily) artichoke hearts, sun dried tomatoes, green peppers and black olives. 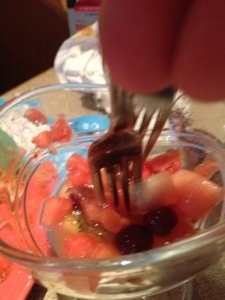 Kman ordered a plain omelet and a side of fresh fruit, which spurred a fork fight for the last few grapes. This morning, late in June, we left Toronto on a three week eastern Canada road trip. Last year we drove from Victoria to Toronto in 7 days in my father’s car. It was an emotionally intense journey. A tragedy to be sure, but the beauty of the landscape was exhilarating. In many ways it was cathartic: we brought my father’s ashes back to the province of his birth and the home of three of his children; in turn our kids have seen the mountains of British Columbia and Alberta, the quiet serenity of Saskatchewan and Manitoba’s plains. This time it will be different. Monday is Canada Day and we’ll be touring around the Cabot Trail. How fitting. We have three weeks to see Quebec, New Brunswick, Nova Scotia (my birth province), Prince Edward Island, Newfoundland and Labrador. Less emotionally fraught and with more time on our hands, we can’t friggin wait. Tomorrow: the Bay of Fundy. 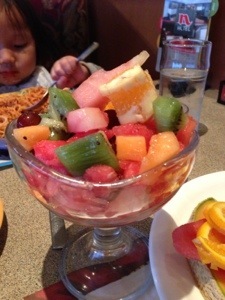 This entry was posted in General and tagged Canada day, guilty vegetarian, rivière-du-loup, road trip, veggie by budbug. Bookmark the permalink. Seriously, glad to see you guys have had a good first day. I stayed in “The Loup” overnight in 2010. Nice town….